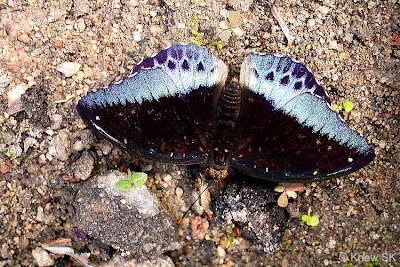 This month we feature another species that exhibits sexual dimorphism - the Archduke. This species is seasonally common in Singapore's nature reserves, and found mainly on shaded forest paths and amongst undergrowth amongst tall trees. The species is seldom seen in open sunny areas, and is a forest-dependent species. 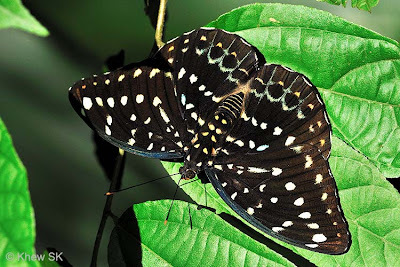 The Archduke belongs to the genus Lexias which consists of rather large, robust and fast flying butterflies. 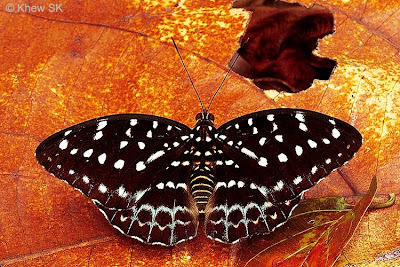 The Archduke is the commonest species of the genus found in Singapore, often encountered feeding on rotting fruits and other organic matter amongst forest litter. 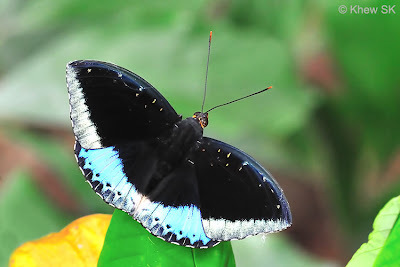 The males are dark velvety black above with a broad blue distal border on the hindwing, which is continued narrowly along the termen of the forewing. The underside is deep ochreous brown with yellow spots. The larger female is dark brown above, and profusely spotted with yellow above and white on the undersides. The underside of the hindwing is pale grayish green. The apical portion of the antennal club is orange in both sexes and this distinguishes this species from the closely-related and very similar Black-Tipped Archduke (Lexias dirtea merguia). The female Archduke is a good example of adaptation by natural selection to camouflage itself better to escape predators like birds. 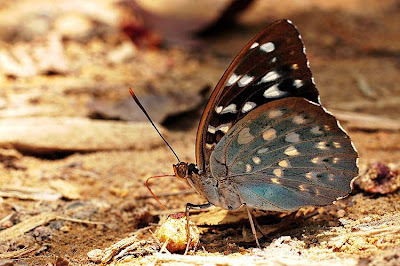 Its dark brown and yellow-spotted wings render it almost invisible as it feeds on the forest floor with dappled sunlight. As many observers will attest, the Archdukes tend to fly rapidly from underfoot when disturbed, as one walks towards their favourite feeding spots along damp forest paths littered with dead leaves and twigs. As they land to feed again, they blend in well with their surroundings, particularly more so with the female. The robust body of the Archduke is an indication of the powerful flight that it is capable of. Once alarmed, the Archduke takes off rapidly with a few wingbeats, and glides amongst the undergrowth. The species is a relatively large butterfly, attaining wingspans of up to 150mm in the larger female. 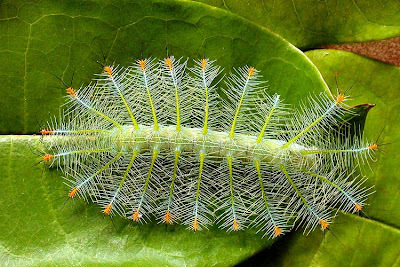 The caterpillar has a rather unique appearance with branched spines that allows it to camouflage itself well on the upper surface of its host plant, Cratoxylum pruriflorum. The branched spines terminate with attractive orange-and-black tips that make the caterpillar appear unfriendly. However, it is not poisonous at all, and can be touched without any danger. In Singapore, there are two lookalikes to the Archduke and may be confused with this species. 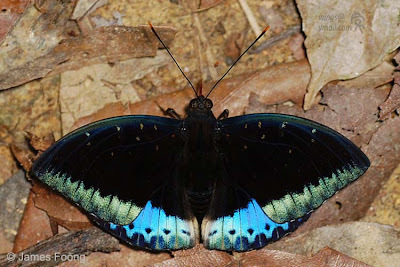 They are the Black-Tipped Archduke (Lexias dirtea merguia) which has males and females correspondingly similar to the Archduke, except that the antennae of the latter species is black instead of orange. 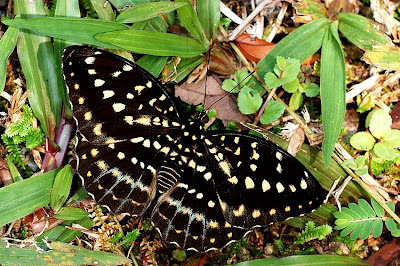 The other species is the Yellow Archduke (Lexias canescens pardalina) in which both the sexes resemble the female of the Archduke, but are smaller in size. All three prefer shaded habitats in the forest understorey in the nature reserves of Singapore.